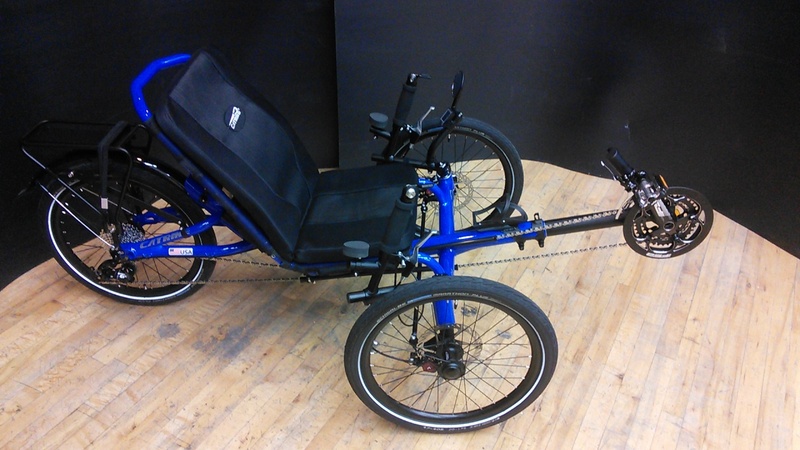 Anyone who says that every Tadpole Recumbent Trike is pretty much the same hasn�t ridden every trike. Each brand has its own feel. And each model, or model class within the brands, usually has its own feel. 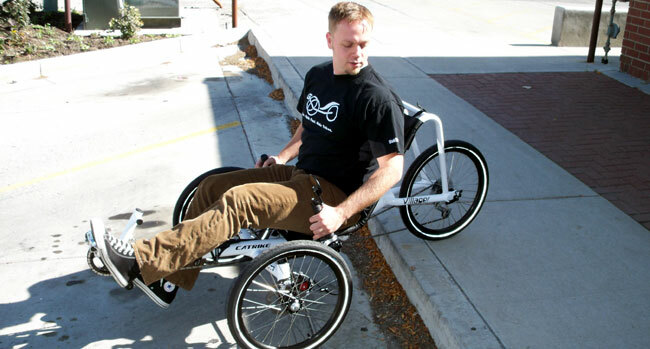 The Catrike Villager rides unlike any trike I�ve ever ridden. It resides in a class all it�s own in the Catrike line up. 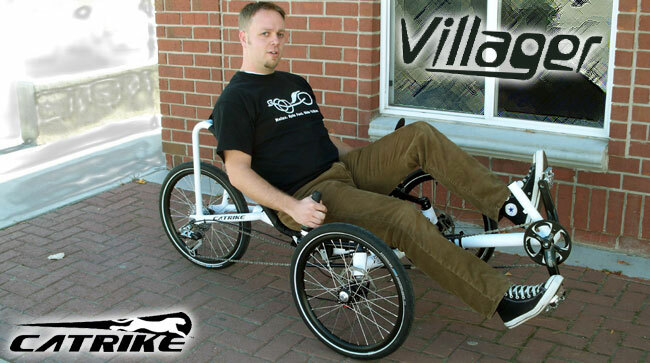 The Villager has a seat height of 12.5�, which is higher than other standard recumbent tadpole trikes. At first, I thought this might make the trike unstable at high speeds. But since the center of gravity is still relatively low, it handles quite well. 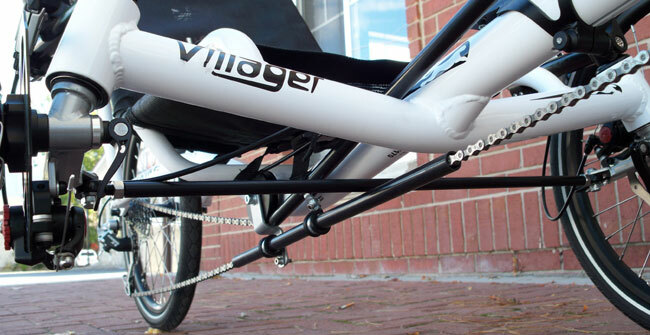 The Villager is the only Catrike I would feel comfortable going off a square sidewalk curb or even some sets of stairs, without fear of damaging the idlers or chain. As is the case with most 20"-wheeled trikes, the rear derailleur is close to the ground, but the rear wheel helps to guard it from damage when going straight off curbs and such. For optimal ground clearance, an internally-geared hub transmission will raise the chain line and eliminate any possibility of damaging a rear derailleur. The standard color of the Villager is white, but can be painted any of the available Catrike optional colors for $99-$149 depending on which custom color you choose. This Catrike comes with Avid BB5 Mechanical Disc Brakes, a SRAM long cage SX5 rear derailleur, a KMC X9 Chain, a SRAM PG 950 11-32 cassette and Schwalbe Marathon tires. 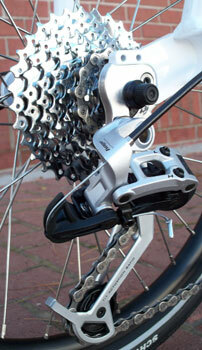 While all these components are of good quality, having only 9 speeds may not be enough for some riders. The easiest way to increase your gear range is by upgrading the single tooth sprocket in the front with a Schlumpf High Speed Drive. 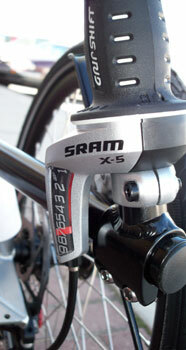 This will give you a greater gear range than having a 3 speed front derailleur setup. If you really do want a front derailleur, you can buy an upgraded boom that accepts a front derailleur. The Villager supports a rider weight of up to 275lbs. It has a comfortable mesh seat that has a reclined angle of 50 degrees and a width of 14". It will accept an X-Seam range of 39" to 46", or with an optional extra long boom up to 53". The angles of the villager frame place your feet almost directly in front of you, rather than slightly elevated like the other Catrike models. I also felt that the seat angle and higher riding height really seems to minimize the road vibrations I felt as a rider, making the experience a very comfortable one. 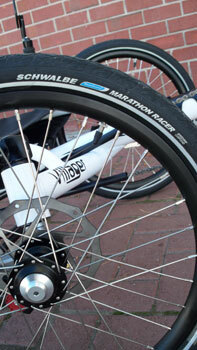 The Villager has 20� tires all around, giving you the advantage of only having to carry one size spare tube. The steering of the Villager is excellent as is the turning radius. 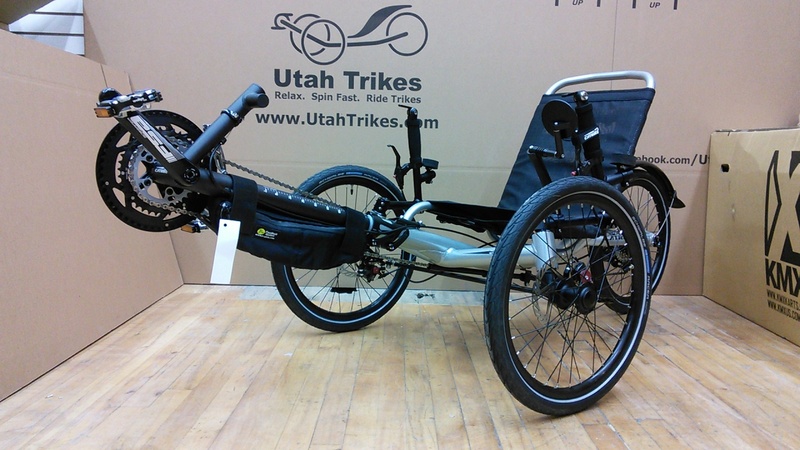 If you�re looking for a Recumbent Trike that�s easy to get in and out of and want to keep the superior stability of a tadpole trike, the Catrike Villager from Big Cat HPV is a very good choice.